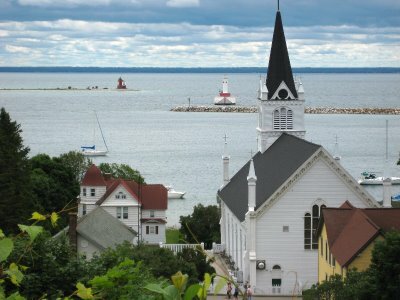 Today we made the trip to Mackinac Island (pronounced Mack-in-aw.) 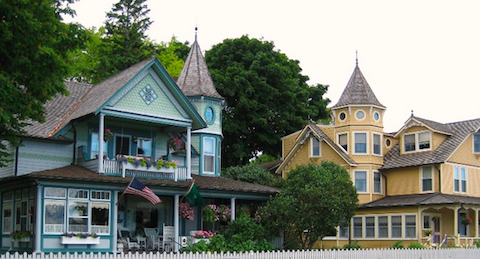 The entire island is listed as a National Historic Landmark and it truly is a special place. 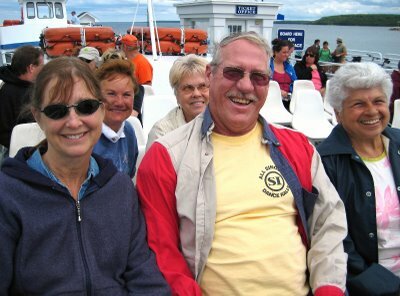 Although the year round population is only a few hundred, in the summer it bustles with tourists and summer residents. 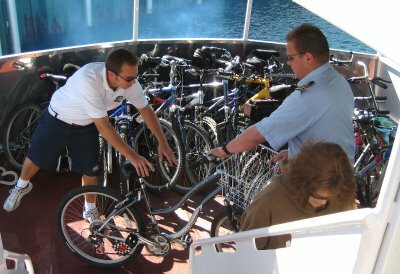 The crew loads all the bikes very efficiently. The 10 o’clock ferry provides an added bonus. 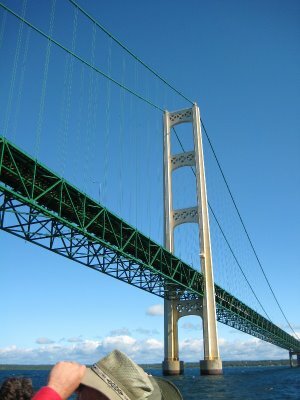 Instead of going directly to the island, it actually makes a pass under the Mackinac Bridge and back before heading to the island. The water was pretty rough and many compared it to a bucking bronco. 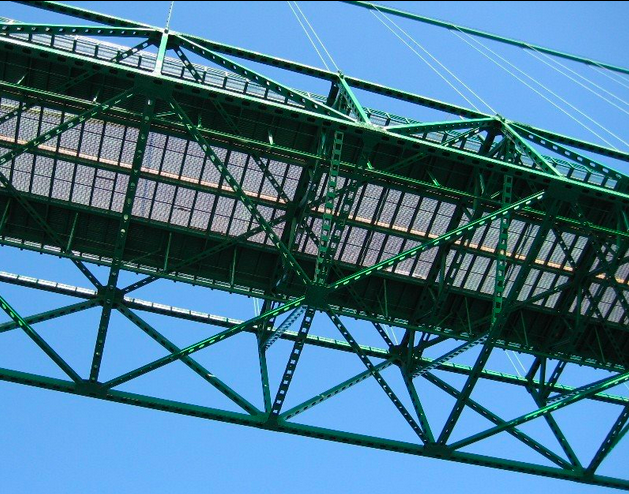 Here comes the bridge. And here we go under it. That was really pretty exciting and much easier than doing it in a kayak which someone had proposed. You can see the middle lanes are metal grid – rather frightening. Because of wind, the speed limit for trucks and RVs was only 20 mph yesterday and it looked like that was the case today too. 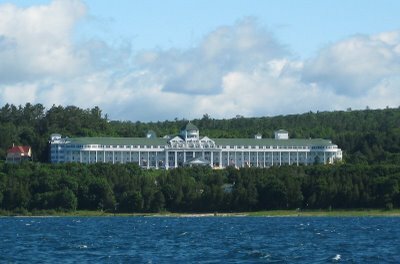 Approaching the island, the Grand Hotel makes quite a statement. 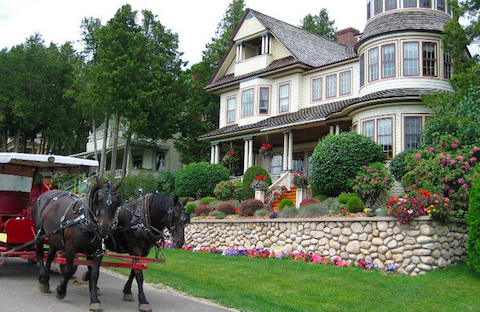 Built in the 1880’s, the hotel is elegance itself and charges riffraff like the WINs to get any closer than about here. For movie buffs, Somewhere in Time was filmed there. 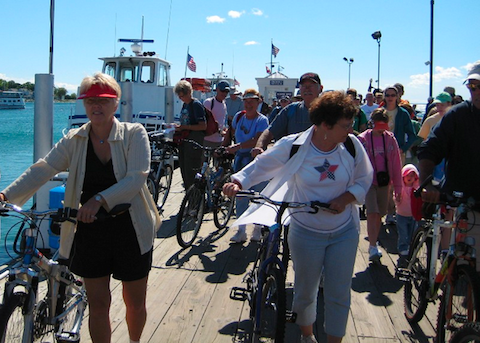 The eight mile biking route around the circumference of the island is M-185, the United States’ only state highway without motorized vehicles. 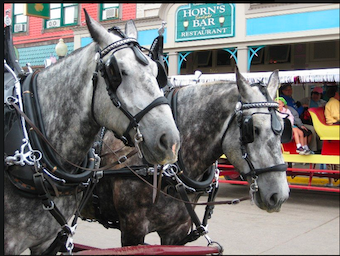 Mackinac Island is primarily known for two things – FUDGE and these guys. I don’t know why their fudge is so famous, but the horses are because motorized vehicles are prohibited, except for emergency vehicles. The combination of the two causes some olfactory confusion – sometimes there’s a heavenly chocolate aroma, sometimes it’s something not at all pleasant, and sometimes it’s a strange combination. Here’s Diana recording the problem. She really will do just about anything for a picture. 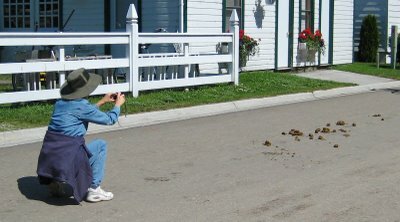 They do have workers who clean up after the horses all day (now THERE’s a job,) but we noticed they can’t keep up with the problem. Leaving the shopping area, we climbed a long set of steps called the Crow’s Nest to another level. There were some nice views, although it was clouding up by then. Continuing up paths and more steps, we finally came to the highest point on the island which is where the British built Fort George during the War of 1812. 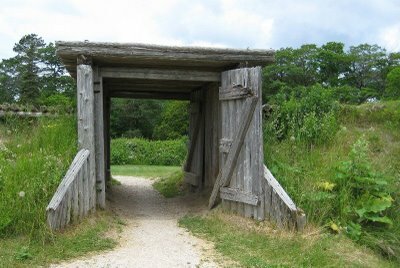 After the war, the fort was renamed Fort Holmes after an American general who died there. The fort is 320 feet above the lake level and commands a 360 degree view of the surrounding lake. 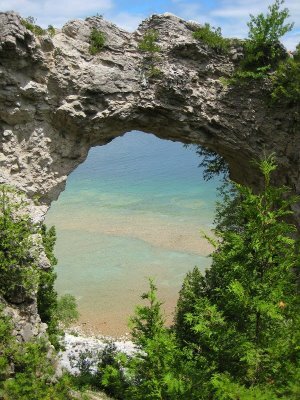 Then we stopped at the famous Arch Rock which frames the colorful shallow water near the shore. You’d think with no motorized vehicles, traffic congestion would be nonexistent, but when we returned to town we saw the influx of pedestrians, bicycles, and horse-drawn carriages cause their own traffic problems. And this was a Wednesday – I’d hate to see it on a weekend. Back on the ferry, tired, but happy WINs head home.